Jimmy really does the Best Moto Tests,,,,, A bike that delivers balance and all the testosterone you could imagine. Great photography and professional analysis. Just add a sixth gear for perfection: but then what would they improve on next year. AER48s are special. specially good right out of the box. Super light feel (they are). a little air up or down and couple of clicks away from nirvana (that's my opinion of them, yours may vary). expensive bikes for sure but no need for much suspension, outside contractor work to be done as we have done on past machines. Yes, reviews of forks are good. Check the tires and,,,the forks may be the new norm. Now if we can minuturize a catalytic converter we might have a Dual Sport Beast. Last F.I. 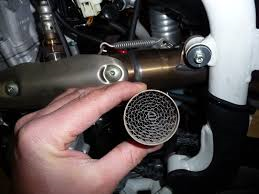 TE450/510 (50 State DS) models of the Italian Husqvarnas had Catalytic Converter device inserts in the exhaust collector section. So it's been done and approved before.